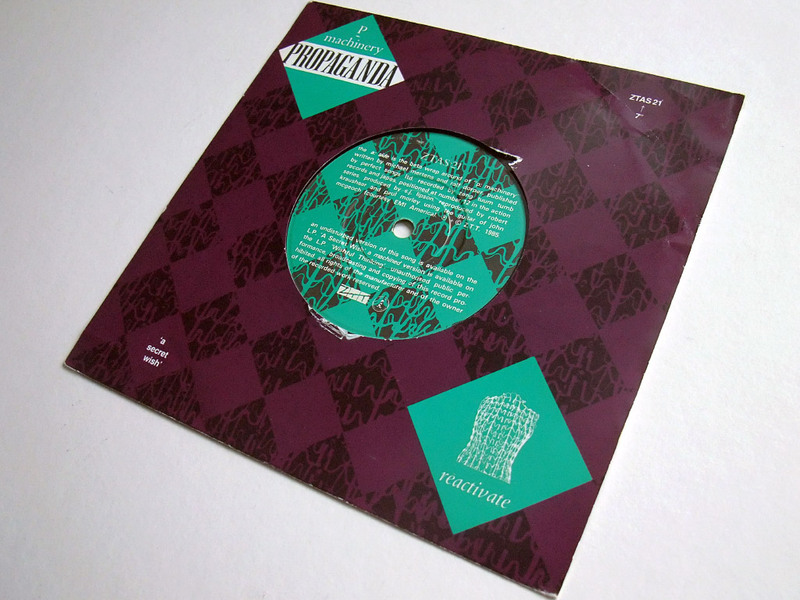 One of my own personal favourite mixes of a track from the meisterwerk that is ‘A Secret Wish’, this second release of ‘P: Machinery’ appeared at the tail of 1985, Propaganda (in their live incarnation) having toured with their ‘Outside World’ live shows. Sadly, it fared no better with chart success than had the first release. For me, this 7″ mix had a darker feel, perhaps due to the more ominous intro, the easiest to spot change from the original version, while the end brass work out repeats to fade rather than slamming to a dead halt, another easy recognition. What I find puzzling now though, and the reason behind this post, is its appearance in digital form. Now, given the amount of mixing and remixing that the ZTT label indulged in, I can understand that it might be difficult to keep up with the variations for fans. But perhaps its equally confusing at ZTT HQ too! Maybe this is what has happened here. ZTT have been on a re-issue and re-compile trip for some while now (and hurrah for that, long may it continue) – but, I find the following; the Claudia Brucken compilation, ‘Combined’ (ZTT/Salvo SALVOCD046), contains amongst its selections the Beta Wrap Around of P: Machinery from the 7″ single release – and unless my ears are seriously turning into cloth, it appears to have been mastered from a vinyl copy, judging by the occasional click and pop. Meantime, the most recent re-packaging of Propaganda’s ‘A Secret Wish’, as a double CD edition (ZTT/Salvo, SALVOMDCD14) comes with a ‘P: Machinery (Goodnight 32)’ mix, claiming to be previously unreleased. But, again, unless my ears remain cloth, this mix is the 7″ Beta Wrap Around Mix by another name – but in better quality than the cut on the ‘Combined’ CD. If anyone else has thoughts on this, do please leave a comment! This entry was posted on Sunday, April 29th, 2012 at 9:57 pm	and is filed under Versions, versions. You can follow any responses to this entry through the RSS 2.0 feed. You can skip to the end and leave a response. Pinging is currently not allowed. Alas, VC, this very day, I find I’m trying to count the number of remixes of “P: Machinery” that can dance on the head of a pin myself! 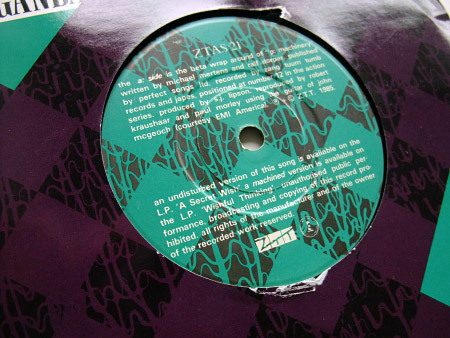 I’m concerned with the 12″ “ßeta Wrap” variations, of which I count three: The 8:03 on “ZTT Sampled” version, the 9:30 on the “train car” 2nd 12″ and the full Monty 10:47 that corresponds to the 7″ re-issue you discuss here. I have both of the recent Salvo CDs that you mention, so I’ll have to give them a critical A/B comparison [with headphones] later this evening. Thanks for chipping in, Monk – from those not already aware, a great post from the Monk at http://postpunkmonk.wordpress.com/2012/05/03/want-list-propaganda-wishful-thinking-dlx-rm/ about the Beta 12″ mixes. I am transferring a lot of my vinyl currently, and its these kind of variations that make the time and effort worth the while. 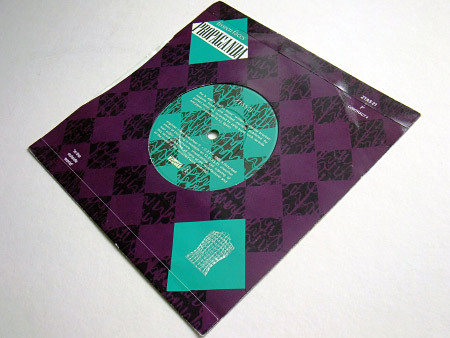 The 7″ Beta Wraparound mix is my own personal favourite – its 12″ cousin has little in common other than the title, so its a puzzle why the 7″ mix didn’t have a different remix name. 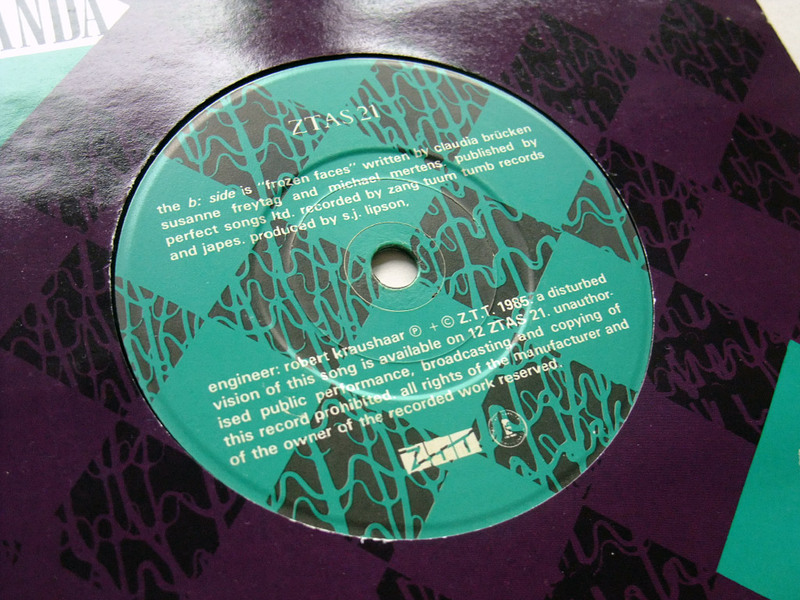 That’s the wonder and frustration of ZTT for you… On the 12″, when it first appeared I wasn’t a fan of the Beta variation, though it has grown on me over time – the guitar of John McGeogh seems criminally under-utilised though. On ‘Wishful Thinking’ itself – never cared much for it. Always seemed a rather haphazard effort and a bit of an affront to the polished perfection of ‘A Secret Wish’. The lure of the extras will of course tempt me into buying the forthcoming re-issue, no doubt about that – apart from the music, they do make an excellent job of the re-packaging all round, which is to be commended in this age of slaph-dash chop-em-out productions. Fascinating, Captain. We’ve never encountered this before. I’ve just A/B compareded the two cuts from CD with cans on and the version on “Combined” is certainly mastered from vinyl. The distinctive intro has typical surface noise while the music is at a lower dB level and there were the occasional muted clicks and pops. On the other hand, the mix on the “Secret Wish” disc 2 had very different crosstalk/grounding noise present in the intro, as if there were some poorly attenuated patchcord used when mixing/recording the intro. Noisy, but definitely not vinyl surface noise. Trust me. I do a LOT of this. Strangely enough, I did hear what sounds like a muted/filtered click around 1:37 on the “Secret Wish” version, implying – again, mastering from vinyl in spite of the lack of surface noise in the intro. Unless that’s a static click on the master with some NR applied to it. As for the mixes, they seem to be identical, but I’ll better find out by dropping them in my DAW and synching/playing them to detect any differences. No time for that just now! On the notes for the upcoming Wishful Thinking release ZTT say they’ve lost the masters for the Beta Wraparound and have to master it from vinyl. Well spot, Mr. Doye. At least they’re assiduously up front about this sort of thing. Better the painful truth than stonewalling. After listening to the vinyl masters on “Combined” I feel even better about my own efforts, which are careful and conservative using consumer level tools and clever methods. I tend to fantasize about how much better my work could sound if I could afford the likes of the [$1200+] Waves Restoration bundle, but after this, I don’t feel so bad.